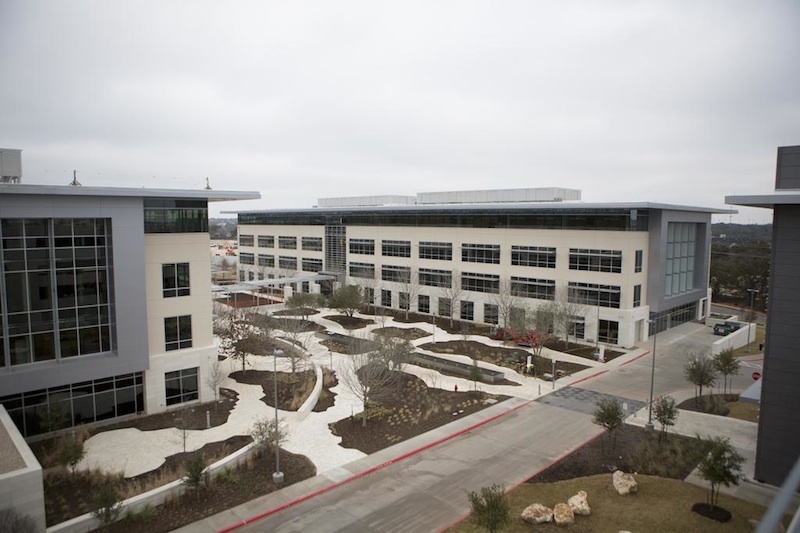 The first two buildings in Apple's new Austin, Texas campus are ready for occupancy, with the company having been issued temporary occupancy permits for two office buildings that span 290,000 square feet, according to a report in the Austin Business Journal. Photos published last year showed the buildings under construction along with a landscaped pond, fences and sidewalks, while new photos accompanying today's report show the initial phase of the campus appearing essentially complete. The Cupertino, Calif.-based technology company has been issued temporary certificates of occupancy for two buildings totaling 290,000 square feet. Another four buildings are in early stages of permitting review, totaling 513,000 square feet. Two parking garages are in the city's planning review process and two other buildings are planned, according to city officials. The plans for the expanded campus were announced in March 2012 and include two major phases of development with an expected completion date of 2021. Apple agreed to invest $56.5 million to build the new facility in the first phase of the project, while the second phase includes a $226 million expansion. Apple is expected to finish the entire first phase of construction before December 31, 2015. Apple committed to spend approximately $304 million on the project and will hire 3,600 employees for the 38-acre operations center when completed. The city of Austin and Texas's Enterprise Fund have agreed to contribute $30 million in incentives to the project. Apple, thus far, has invested $27.1 million in the design and construction of these first two buildings, which are adjacent to Apple's original operations campus in the city.